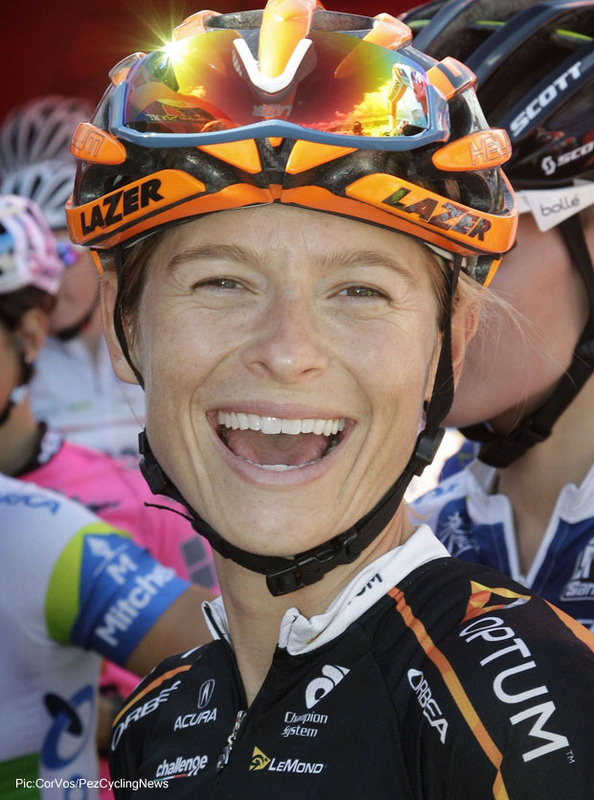 Rider Interview: Ladies' racing is on the up with more top races, teams and sponsors. 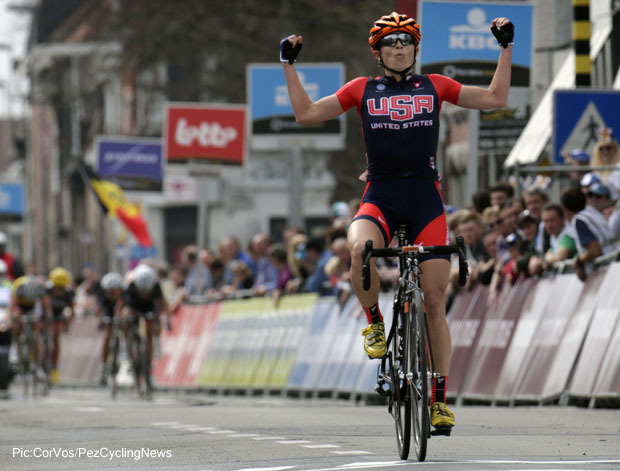 One of the US's unsung heros is 2014 Gent-Wevelgem winner Lauren Hall. 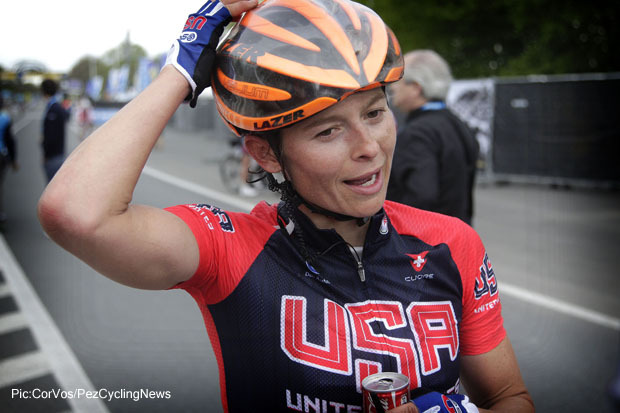 Our own Ed Hood jumped at the chance to interview the Optum rider and get the inside line on life in the women's peloton. 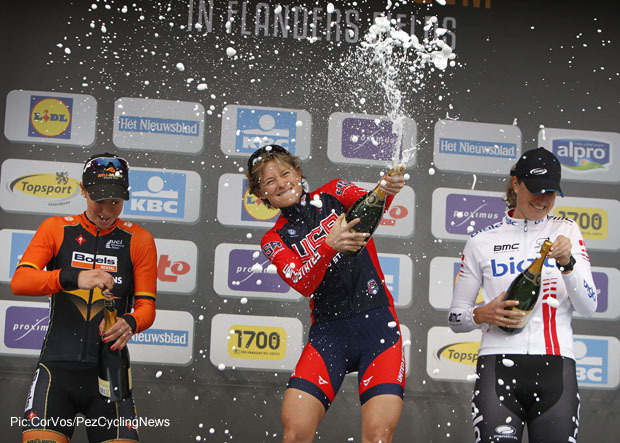 A 2014 ‘big deal’ result in ladies' road racing which rather slid under the radar was Optum rider Lauren Hall’s win in the Ladies Gent-Wevelgem. 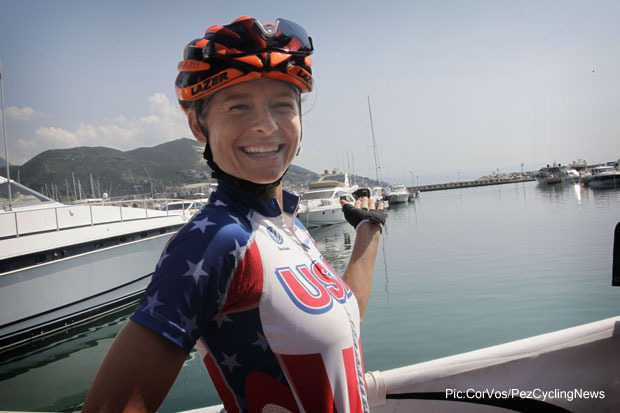 Patrik Lyons of Mission Sports Group who represents the 35 year-old from Mississippi suggested we ‘have a word’ about her career, her big win and ladies cycling in general. We were happy to oblige . . .
PEZ: You won Gent-Wevelgem, tell us about that, please - how big a deal is the ladies' race in Belgium? When we were coming into the last give five K my computer had quit working and I wasn't sure on the distance until I saw the banners. But then the girls started attacking the break and I was wondering if I read the banner right because I couldn't understand why they would start attacking so early, so for a second I was a bit confused, but once we got closer and saw the next banners for one K then I knew that they weren't concerned with me and I just had to be smart on my one attack. I was really excited that I'd finally won a UCI race but I didn't realize how big the win was until I was in doping control with our director, Jack. His phone was buzzing like crazy and he was pretty excited, that's when I knew. All racing is a big deal in Belgium and I love being a part of that culture and I'm forever grateful for those fans. PEZ: You were second in the Giro della Toscana in 2012, did that get you any interest from Italian teams? Again, another race and another result that I didn't realize how big of a deal it was. The second to last day, I was in a break the first five K of a 140k day and it stuck! You never know, huh? I didn't get any interest from Italian teams but I did get more respect and a couple of friendships from that break - funny, huh? You kill each other in the race and then when you all make it to the line together you congratulate each other on a hell of a day. PEZ: You were US Pursuit Champion in 2012 - did you consider going down the track route into international competition? Not necessarily, I use the track for supplementation for the road. I think it would be a wonderful experience but I enjoy road racing more. PEZ: You were third in Philly this year - does the ladies race have the same fanatical audience as the men? Yes! It's amazing coming up Manayunk; you can't hear yourself breathing and the final lap I was breathing hard. Fans love to see a good race, men or women. PEZ: You were fourth in the Worlds TTT with Optum - just six seconds off the podium, tell us about that, please. It was a bit of a roller coaster, sitting in the hot seat, watching teams come in and counting down the seconds when each team inches closer to the finish line, the high of being the best team and then another team comes and knocks you right out of the hot seat, the low. But then there’s the hope; hoping that we will still be one of the best - and we were - but not good enough for a podium. Team time trials are the ultimate test of trust, faith and perseverance, having to pull the group as hard as you can and then just barely getting back on the back of the train and trusting that wheel in front of you to get as close as possible, no other focus except staying there and trying to recover enough to do it all again, over and over. And when you finish as a group, you know everyone has left it all out there and that complete exhaustion is such a catalyst for emotions. We were happy with the improvement from the previous year, we were sad that we weren't on the podium and we were happy it was over but sad that the season was done. It was an emotional roller coaster. This was my first time at the road Worlds and there were no nerves, just readiness to do my job and get a feel for how this race plays out. I understand that some races feel different than others, the Worlds, Olympics, you can see it on TV but to feel it, that's when you gain the experience to know what to expect the next time. The first lap, you could sense how nervous the peloton was and descending to the dam (at the low point of the ‘saddle’ between the two climbs on the circuit, ed.) - crash central for the previous races, it was really nervous. Then the second lap crash, that changed the race dynamics a lot, for all teams not just Team USA. Once my job was done, I had a chance to take in the atmosphere and appreciate the opportunity I've been given. PEZ: You were originally a football player? Soccer, yes! I played on a full scholarship at Mississippi State University and after graduating, I played semi-professional for a year in Memphis, TN. My ambitions were to be a professional soccer player because my grandfather played for the NFL in the 30's and I wanted to keep the family tradition going. I love soccer; I love the game and what it gave me. I will have lifelong friendships from the sport and one of my teammates was from Gent, Belgium and now I've had the opportunity to go back and visit her! She laughs that I ride my bike now because we thought she was crazy, riding a bike to and from practice and around town - who would've thought?! PEZ: You came to cycling late, how did you start out? Once the professional soccer career didn't pan out, I moved to Austin, TX and went to culinary school and while I was there I started running. After graduating culinary school, I ran a marathon in 2006. 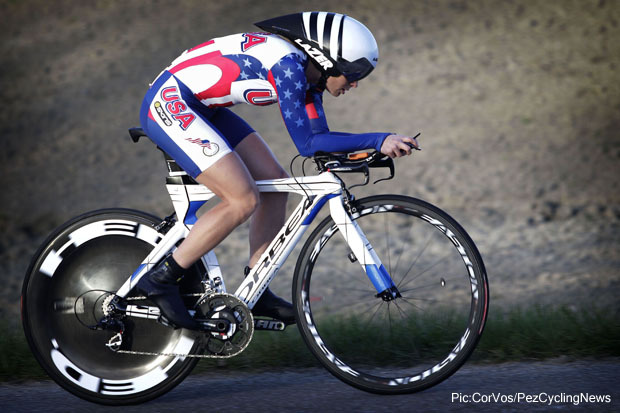 By 2007 I wanted to race a triathlon so I went to a bike shop and bought a bike. From there I started riding on the group rides and that led to racing. I signed my first professional contract in 2010. PEZ: Does your age make it harder to get a contract? Not anymore, now the average age rule has changed. It's interesting to think of a 31 year old as a rider to develop but I think that mindset is starting to change and seeing that Kristin Armstrong was 38 when she won her gold medal, teams understand that the women's peloton operates differently than the men. PEZ: How do your family and friends react to your career? The first couple of years, everyone was supportive but didn't really understand how racing worked and a lot of people would ask, 'How's your bike riding going?' But since a couple of the races have been on TV (Nationals, La Course, Worlds) and having the Worlds in the US next year, bringing racing to the home front, the enthusiasm and understanding is growing, now they want to come to the race and see the world's stage. 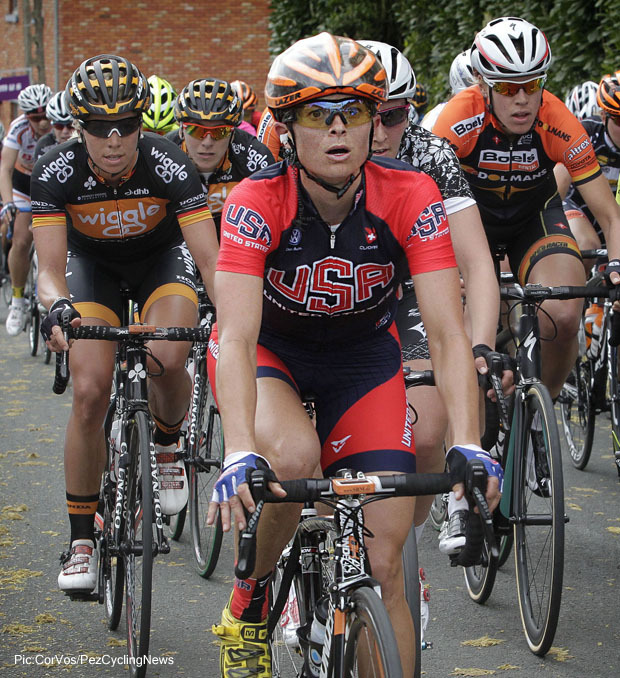 PEZ: Tell us about your training - do you go out with the men on the Optum team? The men are too slow and talk too much, ha! No seriously, we are professionals and we sign a contract that says you show up to races prepared and ready. My training is no different than men's training, except less distance. We don't train with the Optum men specifically but a lot of my rides are with men. In the winter I go to Tucson, warm weather, good rides and lots of power in the rides. I also supplement my training with motor pacing, Pilates and light weights. The Optum women had a couple of TTT camps to prep for Worlds but other than that I have a coach and trust our process. PEZ: Without being specific do girls on US teams make a living wage? The trend is heading in that direction but those individuals just getting into a professional team, probably not. Every contract I've ever signed was only a yearly contract due to sponsor renewal or not and twice I've had teams fold at the end of the year due to sponsorship issues. But now that races are shown live on TV and more in the media, sponsors can see the long term value and are committing more for longer, so I see things moving in the right direction. 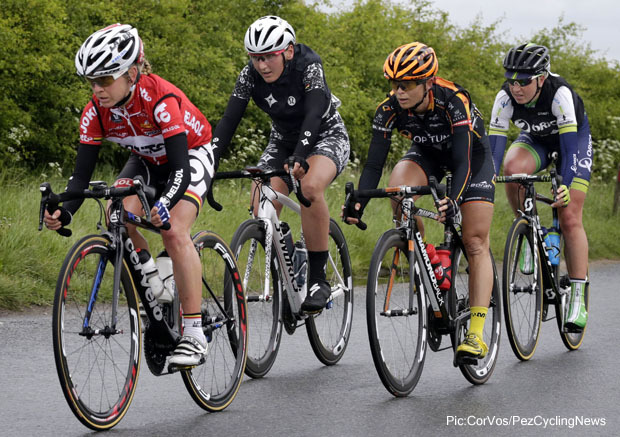 PEZ: If you were the UCi what would you do to help ladies cycling? Keep promoting it in the media, have commentators who know the women's peloton and make sure the races are safe for the athletes. PEZ: If the UCi imposed a minimum wage some think it would be a bad thing in that it would scare sponsors off . . . I don't think it would scare off sponsors but it would kill some of the small teams but I think the small team sponsors could join with some of the more established teams and instead of having rosters of 11, we could have rosters closer to 20 and teams could go to all of the races, year long with split squads. PEZ: What are your goals for 2015 and beyond? My goals for 2015 are to race more in Europe; win some of the big races and make the Worlds team again - all steps leading to the 2016 Olympics. Sometimes it's not all bad being a pro cyclist! It was November 2005 when Ed Hood first penned a piece for PEZ, on US legend Mike Neel. Since then he's covered all of the Grand Tours and Monuments for PEZ and has an article count in excess of 1,100 in the archive. He was a Scottish champion cyclist himself - many years and kilograms ago - and still owns a Klein Attitude, Dura Ace carbon Giant and a Fixie. He and fellow Scot and PEZ contributor Martin Williamson run the Scottish site www.veloveritas.co.uk where more of his musings on our sport can be found.